Apple has pledged $100 million in the form of iPads, desktop and laptop computers, and other educational tools to President Obama's ConnectED initiative that seeks to connect 99 percent of America's students to high-speed internet. "In an unprecedented commitment for the company, Apple has pledged $100 million in iPads, MacBooks, and other products along with content and professional development to enrich learning in disadvantaged schools," the White House said in a release announcing the contributions. President Obama formally announced Apple's contribution alongside similar donations from AT&T, Sprint, Verizon, and Microsoft on Tuesday afternoon. Apple's participation in the program first came to light last week during Obama's State of the Union address. At the time, Apple said in a statement that they were "proud to join President Obama in this historic initiative to transform America's schools" and that "Apple has a long history in education, and we have pledged to contribute MacBooks, iPads, software and our expertise to support the ConnectED project." 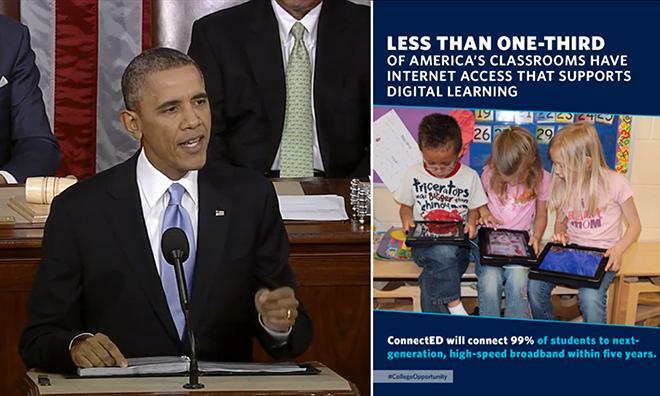 The ConnectED program was unveiled by the White House last June, with partial funding to come from the FCC's existing E-Rate program which provides discounted telecommunications services to schools and libraries. Additional funds would come from donations and partnerships with American telecom and technology companies like Apple. Joining Apple in the initiative are AT&T, Autodesk, Microsoft, O'Reilly Media, Sprint, and Verizon. Together, the companies will contribute more than $750 million to kickstart program, while the FCC will provide $2 billion through E-Rate and the Department of Agriculture will add another $10 million in grants. Apple - Pledged $100 million in iPads, MacBooks, and other products along with content and professional development tools to enrich learning in disadvantaged schools. AT&T - Pledged over $100 million to provide middle-school students free Internet connectivity for educational devices over their wireless network for three years. Autodesk - Pledged to expand the company's "Design the Future" program to be available to every secondary school in the country - offering for free over $250 million in value. Microsoft - Committed to launch a substantial affordability program open to all U.S. public schools by deeply discounting the price of its Windows operating system, which will substantially bring down the cost of Windows-based devices. O'Reilly Media - Partnering with Safari Books Online to make over $100 million in educational content and tools available, for free, to every school in America. Sprint - Committed to offer free wireless service for up to 50,000 low-income high school students over the next four years, valued at $100 million. Verizon - Announced a multi-year program to support the ConnectED vision through up to $100 million in cash and in-kind commitments.